In order to promote harmonisation in a more effective manner in the European patent system, it is argued that this should not solely be done through legislation, but through judicial dialogue and cooperation. Through this means of informal harmonisation, progress can be made case-by-case, rather than waiting for legislation to be agreed upon and entered into force. This is already happening to good effect, as displayed through a number of examples, including the most recent example of Actavis v. Eli Lilly  UKSC 48 in the UK Supreme Court. It is proposed by this article that official lines of communication should be opened among all judiciaries and Boards in the European patent system to improve this practice. Judicial cooperation would also be useful to the Unified Patent Court, if it becomes operational. Opening official lines of communication would be an important step towards a further harmonised European patent system and would increase legal certainty in this area. Karen Walsh would like to thank Dr Naomi Hawkins, Professor Andrea Lista, Dr Aisling McMahon, and Alexandra Mogyoros for their comments on earlier drafts of this paper, Dr Justine Pila for her support and insight, and the anonymous reviewers for their feedback. A version of this paper was presented at the SCuLE IP Work in Progress Seminar and the author is grateful to those who participated in the resulting discussion. This study did not generate any new data. There have been many attempts to introduce a unitary patent system in Europe, in order to promote harmonisation, yet none have been successful thus far. The currently proposed unitary patent system for European Union (EU) Member States has faced many difficulties but is the closest that the EU has come to having a unitary system. However, when discussing the European patent system, consideration must also be given to those countries outside the EU, but within Europe.1 If the currently proposed system enters into force, it will add another layer onto the already multi-faceted patent system both before and after grant. 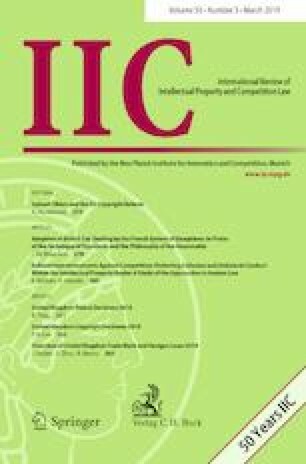 The paper commences by examining and highlighting the shortcomings of existing approaches to harmonisation in the EU and broader European (EPC) context, namely, attempts by the EU and EPC to legislate in this area to promote harmonisation, with a specific focus on patent claim interpretation and the matter of equivalents. This paper argues that legislating in this area is first difficult to reach a compromise on, second, takes a long time to enter into force, and third, does not always have the intended outcome. It will then set out an alternative way forward by developing a novel argument for why there needs to be a shift in thinking about how to secure harmonisation in this context. It does so by examining in detail a means for harmonisation without legislation, which also maintains room for national diversity – that is, informal, yet effective, harmonisation by encouraging judicial dialogue and cooperation. By taking judgments on patent law from other jurisdictions into account, practices will further align, but it will not be required in areas wherein countries disagree fundamentally. It is found that this is already occurring, but it is argued in this paper, for the first time, that official lines of communication should be set-up between the institutions of the European patent system to ensure that the informal harmonisation that is already happening will continue to occur and become more prevalent. In turn, this will lead to stronger legal certainty in the European patent system. A recent case, Actavis v. Eli Lilly  UKSC 48, is then analysed and used as an example of how judicial cooperation works at its best. Decades of precedent was significantly changed by the Supreme Court when a doctrine of equivalents was introduced into United Kingdom (UK) law, aligning practice with its European neighbours. The UK context is being used as the main example throughout this piece owing to its prominence in the European patent system and attitude towards judicial harmonisation. There is also reference to Germany, as well as France and the Netherlands (to a lesser extent), given the high levels of patent law activity in these jurisdictions. However, the arguments made can apply to other European countries. The argument herein can also be taken further if the proposed unitary patent system does enter into force. In that instance, the Unified Patent Court (UPC) can participate in judicial dialogue and cooperation with the currently existing institutions. In a harmonised system, pre-grant search and examination is the same for all countries. As a result, patent applicants will know that their invention is patentable or non-patentable across the jurisdiction and thus could predict its commercial success. This would also be of benefit to third parties who are either trying to avoid infringement or compete with the patent owner. Post-grant, a harmonised system would ensure that decisions on patented inventions across the jurisdiction are mostly decided in the same way and the same result is achieved. For third parties, this brings the certainty that if they are found non-infringing in one country, the same would happen in others. Overall, a harmonised system is also generally less costly than individual systems. Translation requirements are not as burdensome and renewal costs are usually lower than individual systems. This would certainly be of benefit to patent applicants and would also improve European competitiveness in an increasingly international area. To date, there have been numerous legislative attempts at unifying and harmonising the European patent system with a number of major achievements. These attempts date back to 1949, when French Senator, Henri Longchambon, proposed a type of unitary patent system for Europe. The first major achievement regarding harmonisation in the field was by the Council of Europe. Its aim was the unification of the patent system; however, it was believed that this could not be achieved before the harmonisation of substantive patent law matters.6 Therefore, the Strasbourg Patent Convention 1963 essentially harmonised the substantive patent law requirements for all Contracting States.7 Despite these requirements being implemented into national laws, their interpretation can differ. The second major achievement was introduced following proposals for a unitary patent system from the European Economic Community (EEC) and the European Free Trade Association (EFTA).8 The proposals put forward culminated in a two-pronged approach.9 The first was the EPC 1973, which was successfully ratified and entered into force in 1977.10 The main aim of the EPC was and is to stream-line the procedure for the grant of patents in Europe. The second was the Community Patent Convention 1975 (CPC), which twice failed to gather the necessary ratification to enter into force.11 The main aim of the CPC was to introduce a unitary patent for the Member States of the EEC. As there are a number of routes to patent protection available (national/EPC), none so far being unitary, a decision is required each time an application is made, and this can lead to different results in both grant and enforcement. If a patent applicant chooses to apply for protection via the national patent systems, this could result in a patent being granted in some countries and not others. Reasons for this include differing standards of search and examination or morality issues for example. An application through the European (EPC) patent system ensures a standard level of search and examination. In usual circumstances, once a patent is granted by the EPO, national offices will validate that patent automatically or on request. However, there are some areas in which Contracting States have differing views to the EPO on how the requirements of patentability ought to be determined. Whether there would be a difference in the overall result at different offices is arguable, but possible. The main concern regarding harmonisation pre-grant is whether the claims of the patent will be accepted in all jurisdictions. One of the most concerning difficulties with patent claims arises post-grant. In patent law practice, the claims are one of, if not the most important aspect of a patent specification. In the national patent systems, matters of validity and infringement are dealt with by the respective national courts. If a case concerning the same patented invention comes to different national courts, those courts could reach and have reached different decisions. Once an action is brought before any national court, the claims of the patent must be interpreted in order to determine the scope of protection of the patent. This is where the divergence often occurs – whether or not an alleged infringing article falls within the scope of protection of the patented invention. No attempt at a unitary system has so far been successful. It is therefore necessary to reassess how harmonisation can be achieved in the European patent system with or without such a system in place. Although the European patent system concerns countries outside the EU, the EU’s attempts at unifying and harmonising the system through legislation have had an effect on the system overall. It is therefore important to trace the development of the European patent system within the EU agenda. Since the regulation of European patent law was taken over by the EEC from the Council of Europe, patent law has been an integral part of the harmonisation agenda of the EU and the functioning of the internal market. How harmonisation can be achieved through legislation has changed over time. The introduction of mechanisms, such as enhanced cooperation, has allowed for the possibility of harmonisation in certain Member States, without the agreement of all Member States. This type of process is arguably one of the ways forward for harmonisation, a way which allows for harmonisation but not at the expense of national diversity. Due to the limitations of law making in the EU generally – namely, the difficulty of coming to a compromise, or the extent of compromise it takes to reach agreement between a generally expanding number of Member States – it was clear that a change was necessary in how harmonisation could be achieved. With the continued expansion of the EU, in both geographical and legal terms, the methods used to achieve harmonisation had to modernise. This was foreseen as early as 1992, with the entry into force of the Treaty on the European Union (TEU). The TEU introduced mechanisms such as “closer cooperation” between some Member States under Title VI, Provisions on Cooperation in the Fields of Justice and Home Affairs.19 The TEU was extensively criticised at the time for introducing this type of mechanism, which would apparently threaten the cohesiveness and unity of the Community order.20 To only bring some Member States closer together was not something that represented integration at the time. This provision was the first to provide extensive guidance on the mechanism that is known today as enhanced cooperation.21 These guidelines formed the basis of that procedure which allows a number of Member States to move forward with initiatives that would promote the harmonisation of the Union without needing the agreement or participation of all Member States. This procedure also leaves open the possibility for all Member States to join the cooperation in question at a later date, so far as it complies with what is set out in that agreement. The procedure has only been successfully used once so far.22 However, its use for the proposed European unitary patent system has drawn more attention to it, and subsequently to the concept of differentiated integration. Differentiated integration is a concept that goes alongside the procedure of enhanced cooperation. Rather than forcing the currently 28 Member States to compromise on legislation, which can sometimes result in essentially nothing, differentiated integration provides an alternative. It allows Member States that do agree to harmonise certain areas without having to lose the essence of the proposed legislative changes to compromise. Some commentators have even gone so far as to suggest that “differentiated integration is no longer an option, but a necessary condition of progress”.23 Although this is an exceptional stance, the argument behind it has merit. Due to the reasons outlined above with regard to difficulties in law making, a change is needed. Differentiated integration could be that change. Progress can be made on harmonisation even without all Member States participating. The remaining hope is that those Member States who are unwilling or unable to join the cooperation at the time, will do so in future, thus potentially using differentiated integration as a method to achieve “true” EU integration. This concept also allows for harmonisation without requiring a Member State to give up a further portion of its sovereignty when it does not agree with the position being taken. Therefore, harmonisation in this way can be achieved without hindering national diversity. However, as evidenced by the unitary patent package, law making in the field of patents, even by enhanced cooperation, can take a very long time. The current iteration has been awaiting entry into force since 2013 and was debated on and off from 2000 to 2013. It was only with the mechanism of enhanced cooperation that it could move forward, so although the introduction of mechanisms of differentiated integration have assisted, the legislative process still takes a long time, and the end is not yet in sight. Despite Brexit, the UK has ratified the Agreement. However, a question remains as to whether the UK could or would continue to participate in the unitary patent system after leaving the EU given that the unitary patent system is for participating EU Member States.28 If the UK does not participate in the system post-Brexit, the system itself becomes a lot less beneficial to the parties involved. Ratification in Germany has been stalled by a case that has been brought to the German Constitutional Court regarding the constitutionality of the proposed system. The complainant contends that the necessary qualified majority was not achieved when voted on in Parliament and that the Agreement is not compatible with EU law.29 It is expected that the case will be heard in 2019. If it is not dismissed, the proposed system will face even more problems before entry into force. Even if these issues are laid to rest and the proposed unitary patent system enters into force, problems remain that will keep the system on shaky ground. First, it does not include all EU Member States, let alone all European countries; second, whether or not the UK remains in the proposed unitary patent system post-Brexit is questionable; and third, the new system would not replace any of the current systems. These problems all leave gaps in the legislature’s quest for a harmonised patent system in Europe. Therefore, it is even more important to ensure that other avenues for harmonisation are investigated, because with or without the entry into force of a unitary patent system, problems remain. Prior to the implementation of the EPC, countries in Europe had different methods of claim construction. There were two ends of the interpretative spectrum – a strict literal approach and a sign-post approach. Originally in the UK, a strict literal interpretation of the text of the claims was used. This involved viewing the claims of the patent application as the definition of the invention – whatever was claimed was within the scope of protection of the patent and whatever was not claimed was outside the scope of protection. This was the case even if the difference between the claimed invention and the alleged infringing product was insignificant to the functioning of the invention. The House of Lords decided that patent claims ought to be viewed from the perspective of the person skilled in the art who should examine the claims from the perspective of the patentee and take into account their intention. The scope of protection was therefore dependant on the intention of the patentee, striking what was seen as a fairer balance between the interests of parties involved. Germany was at the other end of the interpretative spectrum. Originally a sign-post approach was used, the claims only serving as a guideline to the scope of protection. More important in German claim construction was the “direct subject matter” of the invention, the “technical teaching” of the invention, and also the “general inventive idea”.38 The actual wording of the claims was far less important, which was strikingly different to the literal approach, and a lot more flexible. In comparison to the purposive approach (the early stages of which were seen in Catnic), the sign-post approach was still significantly different, owing to its lack of focus on the wording of the claims. The differences in these interpretative approaches was an issue because by having such differences, contrasting decisions were more likely to emerge on cases to do with the same patented invention. That issue became even more significant on the entry into force of the EPC. The Protocol was and remains extremely vague, however, its inclusion is important. This is especially so because the EPC is a convention that is primarily for the grant of patents, not their enforcement. These legislative provisions were the EPC’s attempt to harmonise a quite divergent area and the results were variable. The Patents Act (UK) 1977 implemented the provisions of the EPC into national law in the UK. Therefore, the judiciary became obligated to take the provisions of the EPC into account. This is highlighted by Sec. 130(7) of the Patents Act 1977, which states that certain provisions of the Patent Act are “framed as to have, as nearly as practicable, the same effects in the UK as the corresponding provisions of the European Patent Convention”. As mentioned, Catnic was decided before the EPC became law in the UK. The next case regarding patent claim interpretation that came before the House of Lords was Improver v. Remington.41 Here, the House of Lords took the opportunity to decide on patent claim construction under the new law. In doing so, Lord Hoffman stated that a purposive approach towards claim construction ought to be taken and formulated three questions that the court could ask when dealing with patent infringement and variants. First, it is asked whether the change makes a difference to the functioning of the invention.42 Then, it is asked whether that would have been obvious to the person skilled in the art at the date of publication.43 Finally, the perspective of the patentee is taken into account, where it is asked whether the person skilled in the art would have thought that the patentee intended that a strict reading was an essential requirement of the invention.44 These questions maintain the approach that had been taken in Catnic regarding claim construction. In Kirin-Amgen, Lord Hoffman explained that the Protocol Questions were to be used as guidelines and not blindly because in certain instances it would be very difficult to apply the questions to the facts of the case.47 Since that judgment, the courts in the UK showed reluctance in applying the Protocol questions and instead followed the guidance of Lord Hoffman in Kirin-Amgen. For 15 years this practice progressed, with courts and practitioners becoming familiar with the approach taken. This was not the only issue that caused controversy with regard to claim construction. As mentioned, in 2000, an amendment was made to the EPC that had a follow-on impact in the UK. Article 2 of the Protocol on the Interpretation of Art. 69 EPC was introduced, which required that due account shall be taken of equivalents. Lord Hoffman said that the problem lay in that once the protection expanded outside the claims, question arises as to where the line is to be drawn with variants.49 To avoid the issue of non-infringing immaterial variations, he favoured an approach that abandoned literalism in construction, rather than the introduction of a doctrine of equivalents.50 His view was that by introducing the purposive approach to claim construction, this would take any immaterial variation into account. It was seen as an element of construction and therefore within the scope of the claims, rather than outside. The implementation of the provisions of the EPC and the guidance on claim interpretation had little to no effect in the UK. The Protocol was and is so vague that it can accommodate several approaches to patent claim construction. Courts in the UK had already moved away from a literal approach to claim construction, as seen in Catnic. Further, Lord Hoffmann made it very clear that the practice in the UK regarding equivalents at that time was in line with the EPC and with the Protocol and therefore no changes were necessary. This departure from previous practice shows the impact of the legislative provisions in the EPC on the law in Germany. Courts now look at the claims of a patent as a decisive factor in determining the scope of protection. Further, the implementation of questions somewhat similar to those in Improver encourages harmonisation. However, as Matthew Fisher has argued, divergences remain in decisions, possibly due to the philosophical foundations of the patent systems in Germany and the UK – the former being focussed on rewarding the inventor and the latter focussing on boosting innovation.61 It could also be argued that these divergences also stem from the differences in the treatment of equivalents by both Contracting Member States. Although Art. 69 EPC and the Protocol did change legal practice in certain Member States regarding the determination of the scope of protection of a patent, problems remained. National courts were reaching different outcomes in infringement actions relating to the same patented invention despite interpreting national laws that all implemented the provisions of the EPC. The most famous example of this is the Improver case. It was argued by the claimant that their European patent, designated in numerous Contracting States, was infringed by the defendant in the UK, Germany and the Netherlands. Actions were brought in each of the relevant national courts. The issue of equivalents was seen as the point where the UK courts differed to other continental courts.65 In Germany and France, for example, a doctrine of equivalents can be used. How it is implemented differs from country to country. In Germany, for example, the Schneidmesser questions are used to determine if a variant is an equivalent. In France, two means can be considered equivalent if they realise the same function or result, and so the effect or purpose of the variant is the central aspect to be considered when using the French doctrine of equivalents. Furthermore, the French Courts do not look at obviousness nor the intent of the patentee. However, the relevant function must be new, otherwise there will never be infringement by equivalents. In attempting to promote harmonisation in areas such as claim construction, legislation has not been as successful as intended. As there were two extremely different interpretative methods, a compromise had to be provided for – a meeting in the middle. Although this has changed the practice in Germany, the same cannot be said for the UK. The vague guidance that was introduced by the Protocol has left room for Contracting Member States to implement the guidance in a way that fits with their current approach. This is not to say that the Protocol has been ineffective. It is however difficult to ensure that all Contracting Member States interpret patent specifications in the same manner, especially given the differences that exist in national economies and procedures. Through this example, it can be seen that by reaching a compromise and meeting in the middle, the resulting Protocol was extremely vague. Furthermore, it can be seen that legislative attempts do not always fulfil the intended outcome as not all Contracting Member States changed their practice to align completely with the guidance of the Protocol. It is therefore important to discuss different methods that may promote harmonisation without legislation. It is proposed by this article that the way in which the harmonisation of European patent law can be achieved most effectively, and without legislation, is through judicial dialogue and judicial cooperation. In fact, this is already happening quite successfully and is something that should be encouraged and formalised amongst all the institutions of the European patent system. There are two ways in which this is currently being achieved. First, judges from the various institutions of the European patent system are looking towards one another’s decisions. Second, judges are meeting regularly to discuss developments in patent law in general and areas where harmonisation can be achieved. As mentioned, one of the main concerns regarding the European patent system is the divergence in decisions on the same patent amongst national courts.68 Judiciaries have, however, been taking steps in order to reduce the possibility of such divergence. One of the ways this is being done is by looking towards the practice in other courts/Boards. The Supreme Court can be seen to promote a harmonised approach to interpretation, however, also leaving a door open in case the BoA are taking the law “in an inappropriate direction”.76 By promoting this kind of practice, courts in the UK are encouraged to follow the jurisprudence of the BoA, yet they are not forced to. This allows for continued conversation and dialogue, not to mention national diversity. When determining whether harmonisation is required, or beneficial, national courts can look at the precedent of their own court, compare it to the alternative approaches or decisions of other courts, and if it is different, the court can decide whether the area in question should be changed to align with how the majority of other countries are interpreting the issue at hand or whether this is an issue of cultural difference. This will be dependent on the viewpoint and culture of that country, and judicial cooperation leaves scope for this type of disagreement. There will always be diversity in the European patent system and that is not something that should be removed. The scope for disagreement is of significant importance in areas such as morality. Morality is an area on which countries in Europe can differ significantly, for example, what should and should not be patentable. For example, the interpretation of the exception to patentability for the commercial exploitation of inventions resulting from the destruction of human embryos had differed from country to country prior to Court of Justice of the European Union (CJEU) case law. When it comes issues concerning, for example, morality, human dignity, and ordre public, this scope for divergence needs to exist. Judges in all jurisdictions ought to be able to go against the majority if there is such a reason to do so. It is important that these types of issues remain open to debate and that national diversity remains, given the importance of these topics, the different views involved, and the changing nature of technology. This leads to a second aspect of domestic judicial practice that promotes harmonisation and cooperation – to consider the decisions and interpretations of other national courts. In Grimme v. Scott,80 the UK Court of Appeal emphasised the importance of taking the decisions of other national courts into account, even if no such decisions are presented to the Court by counsel. Advocates should recognise that where a point of patent law of general importance, such as the construction of a provision which by Treaty (either the EPC or the Community Patent Convention) is to be implemented by states parties to those conventions, has been decided by a court, particularly a higher court, of another member state, the decision matters here. For, despite the fact that there is no common ultimate patent court for Europe, it is of obvious importance to all the countries of the European Patent Union or the parties to the Community Patent Convention, that as far as possible the same legal rules apply across all the countries where the provisions of the Conventions have been implemented. An important decision in one member state may well be of strong persuasive value in all the others, particularly where the judgment contains clear reasoning on the point. Broadly we think the principle in our courts – and indeed that in the courts of other member states – should be to try to follow the reasoning of an important decision in another country. Only if the court of one state is convinced that the reasoning of a court in another member state is erroneous should it depart from a point that has been authoritatively decided there. Increasingly that has become the practice in a number of countries, particularly in the important patent countries of France, Germany, Holland and England and Wales. Nowadays we refer to each other’s decisions with a frequency which would have been hardly imaginable even twenty years ago. And we do try to be consistent where possible. As well as advocates being encouraged to present decisions from other courts on the same issues, the court has also emphasised the importance of taking the decisions of other national courts into consideration. The court again left a door open for divergence in cases where national courts disagree on the reasoning behind a decision, but the main point was that of promoting cooperation and consideration. It was noted in the statement above by the court in Grimme v. Scott that the judgments of other jurisdictions are now referred to frequently by courts in England & Wales, Germany, the Netherlands, and France, relative to 20 years ago. This is indeed the case as this practice of taking other national court jurisprudence into account can also be seen in other jurisdictions. In Germany, the Supreme Court has ruled that not only do German national courts have to take the decisions of the BoA into account but went further and stated that they must also consider the decisions of other national courts relating to similar subject matter. From this judgment, it can be seen that similar guidance is being given to German national courts as in the UK. The doors are left open for possible divergence; however, this should only be in cases where there is an appropriate reason. As the German Supreme Court now requires that these reasons be given, this will assist in discovering where the lines of divergence emerge, and how or whether those lines can be drawn closer together in order to achieve further harmonisation. In France, proceedings from other courts are increasingly considered.95 Searches are conducted as to proceedings taking place in other jurisdictions, and their relevance to the case at hand is examined. Examples include: Mylan v. Astrazeneca, Warner-Lambert v. Sandoz, MVF 3 APS v. S.A.R.L Intelligent Insect Control, Lilly France v. Sanofi-Aventis Deutchland, and Akzo Nobel v. Teva Sante.96 However, due to the brevity of French court judgments, it is not always known how relevant other decisions have been in these decisions and others. The relevant cases are cited and often analysed to a certain extent, but it is not clear how much importance is placed on these decisions. It could be argued, however, that the relevance of other decisions will depend on the similarity of the issues and the facts of the cases, some being more relevant than others depending on the facts. That other proceedings are even mentioned in these decisions, implies that they are at least discussed and considered, even if the same conclusion is not reached. Although some higher level courts have been encouraging courts at different levels and in different countries to take other patent law decisions into account, it has been on the basis of this being a persuasive authority. Taking the argument one step further, it could be argued that judges of the European patent system have a positive duty to cooperate with one another, their respective countries having freely signed up to the EPC. Therefore, it can be seen that the BoA also promote the informal harmonisation of European patent law, and as G5/83 displays, they are willing to consider the reasoning and interpretation of European patent laws from Contracting State courts. Furthermore, the emphasis placed on interpreting the EPC with a view to promoting harmonisation was criticised because not all national laws are harmonised and therefore it would be impossible to decide which interpretation from which national court the BoA ought to follow.100 However, through more dialogue, a Board could look at the different interpretations of national courts and decide on a “best practice” approach. Additionally, national decisions have no binding effect on the BoA. The EPC is the only source of law that is binding on the EPO. Therefore, proceedings before the EPO are decided in accordance with the EPC and even if the reasoning of a national court would lead the EPO to the same conclusion, the Board must first apply the provisions of the EPC and assess the jurisprudence of the BoA in order to make a final decision.101 This explains why, in practice, national decisions are still rarely explicitly taken into consideration and why, for the BoA, the EPO has the final say in matters relating to the interpretation of the EPC. Judicial dialogue already exists formally within the EU between the Member States and the CJEU in matters concerning the protection of biotechnological inventions. Member States are under an obligation to refer questions on the interpretation of this Directive to the CJEU.106 This has occurred in a number of cases,107 and although the resulting decisions have caused quite a controversy,108 the referral is a useful mechanism that could be introduced across the European patent system among national courts and BoA. It was a disappointing reference for Lord Justice Jacob, who had made the “referral” in the first place, because the questions referred to the Board did not reflect those that had been originally proposed and the conflicting decisions identified by the UK court had not been very well explained; the experiment came to nothing.112 If an official line of communication had been opened between Contracting States and the BoA, akin to the CJEU referral mechanism, further harmonisation could have followed. Judicial cooperation is not only seen in the decisions of courts. The second way in which this is occurring is through regular meetings of judges in the field. The EPO is playing a key role in promoting this type of informal harmonisation. They do so in a number of ways including: first, by instigating and organising the biennial European Patent Judge’s Symposium and annual European Judges’ Forum; second, by having a number of national judges acting as external members of the Enlarged BoA; and third, by arranging judicial internships at the EPO for national court judges. Beier went on to say that European patent law will be shaped by case law, and that “its true contours will emerge only from a multiplicity of individual decisions”.115 Every two years, judges involved in patent law from all avenues – national courts, the BoA, and representatives from the CJEU – come together and discuss developments in patent law in order to continually develop and build up judicial cooperation across Europe. This is an extremely important event for the harmonisation of European patent law. These meetings will presumably continue to take place and if they do, will continue to serve the aim of European cooperation in the patent field by promoting the harmonisation of substantive patent law and procedure by informal means. Every year, in October, European patent law judges also meet in Venice at the EPO European Judges Forum. Similar to the Symposium, this event gives judges the opportunity to discuss the latest developments in European patent law in their countries and elsewhere. Along similar lines, judicial internships are also available for national judges of the Contracting States at the BoA. These internships promote equal access to training and provide the opportunity to undertake an intensive course on patentability and procedures at the EPO and the opportunity to “shadow” a member of the Technical BoA. In doing so, they enable national judges to experience the practices of the EPO, which can then be filtered back to their own national courts. The above examples display some of the efforts that have been undertaken by the judiciary/BoA to promote informal harmonisation through judicial dialogue and cooperation. This kind of activity has indeed become more frequent; however, differences remain between courts when it comes to interpretation, but also when it comes to procedures and the evidence brought before each court. Despite these differences, decisions of other national courts, or the decisions of the BoA, can still be considered, and this should be done even more frequently. It is argued that if judicial cooperation were to happen regularly, the European patent system would become a lot closer and would not be dependent on the implementation of legislation that may or may not improve the situation. Although judicial cooperation may not always lead to convergence,119 it is a step in the right direction. To promote judicial cooperation and ensure dialogue between the courts, an online framework of official dialogue could be introduced to assist the judiciary when making decisions on European patent law. Courts would first have to consider whether the patent in question before them had been or was currently being litigated elsewhere. With an online framework, all cases could be uploaded and machine translated to assist with accessibility. Judges could look at the decisions of other courts or decide to stay proceedings to await the judgment of another court hearing the case. Doing so would likely depend on the level of the court and the experience of the judiciary making the decision. If the case concerned a patent that had not been litigated previously, the court could investigate its approach to, for example, deciding on the patentability of an invention or sufficiency, and compare it to other courts and the BoA. By doing so, it could learn what the majority of European countries consider when dealing with these issues and decide whether practice could or should be changed in that country as a result. An open dialogue system could also be introduced, wherein judges could access a confidential online tool linking them to judges in other jurisdictions. Questions and answers could be posted which would eventually become a massive resource for current and new judges. Discussions could be had on a case-by-case basis pre-decision, rather than once a year at a judge’s symposium post-decision. This would hasten the speed by which this informal harmonisation occurs. In final written decisions, if departing from the status quo, all judges could also be required to expand on why they have departed from the majority view. If this were to happen more frequently, further steps could be taken in analysing how harmonisation could occur in these areas, if it should. Finally, it should be possible for national courts to refer questions to the Enlarged BoA on the interpretation of provisions of the EPC. By introducing such a mechanism, clear guidance would be given to the Contracting Member State concerned, and this response could also be used by other Contracting Member States in the future. Certain risks need to be considered, such as that of judicial law making. However, as long as the framework is not taken so far as to introduce new laws, or unfounded interpretations of laws, the judicial cooperation/dialogue model would be of benefit for the harmonisation of the European patent system. In 2007, following a detailed investigation by a number of authors (including academics, judges and litigators) into the practice of eight countries in Europe with regard to the interpretation of patents, Jochen Pagenberg concluded that amongst all questions discussed “one problem appears as the most difficult to solve, namely how equivalents will be treated in the various jurisdictions all over Europe”.120 At the time, as elaborated upon above, the UK practice towards (or in this case, against) equivalence stood out from the approaches of other European jurisdictions and the rejection of the doctrine of equivalence was seen as disregarding the balance required by the Protocol on the Interpretation of Art. 69 EPC.121 However, recent developments in the UK have gone a long way in providing a solution to this most difficult problem and provides an excellent example as to how judicial cooperation and dialogue can lead to greater harmonisation in practice. The most recent and potentially most impactful example of judicial cooperation came in a recent decision of the Supreme Court of the UK and proves how well it can be used as a means to promote harmonisation in the European patent system and shows the impact that it can have. The question before the court was whether Eli Lilly’s patent on the use of pemetrexed disodium in the manufacture of a medicine for use in combination with vitamin B12 for the treatment of cancer, was infringed (directly and/or indirectly) by Actavis’s proposed products that did not use pemetrexed disodium, but pemetrexed diacid, pemetrexed ditromethamine, or pemetrexed dipotassium.123 Essentially, did Eli Lilly’s patent cover compounds other than pemetrexed disodium? He said that in interpreting claims like this, English law complies with the Protocol on the Interpretation of Art. 69 EPC, including Art. 2. The case was further appealed to the Supreme Court. In one of his final cases as President of the Supreme Court, Lord Neuberger took the opportunity to clarify how claims ought to be interpreted in the UK so as to be in line with the requirements of the EPC and the Protocol on the Interpretation of Art. 69 EPC. In doing so, and despite precedent from the Supreme Court in Kirin-Amgen pointing in the opposite direction, he introduced a doctrine of equivalents into patent scope determination in the UK. By changing the law on claim construction and allowing for a doctrine of equivalents, courts can now consider to what extent the scope of protection of a patent can extend beyond the meaning of the claims in context.130 This is completely against the reasoning of the Supreme Court in Kirin-Amgen and thus changes legal practice in this area significantly. First, as mentioned, this is a significant change to the legal precedent in the UK. Owing to this decision, practice around drafting patent applications will need to change, and arguments before courts in matters of infringement will have to be carefully considered. Attorneys will have to consider whether to raise an argument of infringement by equivalents, which could imply that their case of literal infringement is weaker (literal in the patent context, not in the textual context). Second, this judgment brings the UK more into line with other countries in Europe. The Supreme Court investigated how equivalents were used in other countries in its reasoning.137 Although in this case, the Court was under an obligation to consider the law from other jurisdictions because the UK court was deciding on patent designations in a number of other countries, it can still be applauded from a harmonisation perspective. By looking at the law from these jurisdictions, parallels and distinctions can be drawn, which can lead to either a more harmonised approach, or a realisation as to why divergence occurs. As considered in Pagenberg and Cornish, “greater harmony can only be achieved, if the rules are not only consistent with the Protocol, but also correspond to those of other member countries of the EPC”.141Actavis v. Eli Lilly displays how, in practice, this greater harmony can be achieved. It is yet to be seen how arguments of equivalents will be made before the courts, and whether the UK courts will follow the German or French approach. More likely will be the German approach, owing to the modified Improver questions being closer to the Schneidmesser questions.142 However, Lord Neuberger did question the appropriateness of the German courts sometimes requiring the variation not to be inventive in the second question.143 Nevertheless, what can be seen is an effort to bring the European patent system closer together by judicial cooperation and explanations as to why one court may not agree with another. This approach could be further promoted if the unitary patent package enters into force. This proposed system would introduce a new judicial institution – the UPC – into the field of the European patent system. In order for the UPC to be successful, dialogue between it and the current judiciaries and Boards is essential given that not all European countries will participate, and because of the continued existence of current systems.144 The UPC will have to decide on how to deal with infringement145 and equivalents, and now that most European countries implement a doctrine of equivalents, it would be appropriate for the UPC to do the same. In this article, it has been shown that legislative attempts to promote harmonisation by the EU in the European patent system have been unsuccessful, and those implemented by the European Patent Organisation have only assisted to a certain extent. Law making in this area has been seen to take an incredibly long time, which when successful is a compromise, which does not always have the intended impact. The problem of divergence in patent law interpretation and decisions on the same patented product in different courts or BoA continues to occur. In order to promote harmonisation in a more effective manner, it is argued that this should not solely be done through legislation, but through judicial dialogue and cooperation. Through this means of informal harmonisation, progress can be made case-by-case, rather than waiting for legislation to be agreed upon and entered into force. It was seen that this is already happening to good effect, as displayed through the most recent example of Actavis v. Eli Lilly in the UK Supreme Court. It is proposed by this article that official lines of communication should be opened among all judiciaries and Boards in the European patent system to improve this practice. It is also suggested that there is a positive duty to cooperate. Contracting Member States have signed up willingly to the EPC and the argument could be made that they are required to take its interpretation into account. Opening official lines of communication would be an important step towards a further harmonised European patent system and would increase legal certainty in this area. Furthermore, this would also assist the UPC, if introduced. When decisions of other courts are taken into account, best practice can emerge and be used in the unitary patent system. If this were to happen, a trickle-down effect could occur where judges sitting on panels of the UPC would return to their national court and potentially implement the practice of the UPC, thus increasing harmonisation further. Significantly, this method also leaves room for national diversity, which is of the utmost importance when it comes to areas such as ordre public and morality where countries often differ. There will always be an element of divergence in the decisions of the European patent system. This is even seen within the same court system, for example between courts of first instance and courts of appeal. However, by implementing such a solution to the current problem, taking all of these factors into account, the entire European patent system can move forward with its goal of harmonisation to the fullest extent and in the most effective manner. Those countries are: Albania, Iceland, Liechtenstein, Former Yugoslav Republic of Macedonia, Monaco, Norway, San Marino, Serbia, Switzerland, Turkey. Graham and Van Zeebroeck (2014), pp. 655, 708. This evidence has been confirmed in another more recent study published in 2016: Cremers et al. (2016). In this article, when referring to the European patent system this does not refer to a specific patent system and includes both EU and non-EU countries; when referring to the European (European Patent Convention EPC) patent system, this includes the Contracting States to the EPC and refers to the system implemented by the EPC; and when referring to the proposed unitary patent system, this refers to the system that may be introduced by the unitary patent package and includes participating EU Member states only. When speaking of “judicial” dialogue, for the purpose of this article this will include national court judges, judges from the Court of Justice of the European Union, and members of the Boards of Appeal of the European Patent Office. Although the Boards of Appeal are quasi-judicial, they do exercise similar functions (albeit in the patent context) and act in the same spirit. For more on harmonisation, see Van Pottelsberghe (2009). Wadlow (2010), pp. 123, 126. Convention on the Unification of Certain Points of Substantive Law on Patents for Invention 1963 (Strasbourg Patent Convention); For a detailed analysis of the Convention, see Wadlow (2010). Pila (2013), pp. 917, 926. Pila (2013), p. 926; citing Ladas (1975), p. 633. Convention on the Grant of European Patents of 5 October 1973 (European Patent Convention) (EPC). Convention for the European Patent for the Common Market (15 December 1975) (Community Patent Convention) (CPC); re-enacted as Council Agreement 89/695/EEC of 15 December 1989 relating to Community Patents  OJ L 401/1. The most famous example being Improver v. Remington: UK – Improver Corp v. Remington Consumer Product Ltd  F.S.R 181; Germany – Improver Corp. & Sicommerce AG v. Remington Products Inc, Case No. 2 U 27/89 (OLG 1991) translated in 24 IIC p. 838 (1993); the Netherlands – translated in 24 IIC p. 832 (1993). This has happened in a number of cases, which will be discussed below – the most famous example is the Improver v. Remington case. For a detailed analysis on the history of the UPC, see Wadlow (2013). The package consists of: Council Regulation (EU) 1257/2012 of the European Parliament and of the Council of 17 December 2012 implementing enhanced cooperation in the area of the creation of unitary patent protection  OJ L 361/1; Council Regulation (EU) 1260/2012 of the European Parliament and of the Council of 17 December 2012 implementing enhanced cooperation in the area of the creation of unitary patent protection with regard to the applicable translation arrangements  OJ L 361/89; and Council Agreement 2013/C on a Unified Patent Court  OJ L 175/01 (UPCA). For a summary of the main critiques, see Hilty et al. (2012). Although the UK have ratified the UPCA, following Brexit questions remain regarding UK involvement in the proposed system. A case has been brought before the German Constitutional Court challenging the constitutionality of the German ratification legislation. The Hungarian Constitutional Court decided that there is no mechanism in place for the Agreement to be ratified in Hungary. Article K.7 TEU. Closer cooperation was a precursor to enhanced cooperation. Now contained in Art. 20(2) TEU. Council Regulation (EU) No 1259/2010 of 20 December 2010 implementing enhanced cooperation in the area of the law applicable to divorce and legal separation. Council Document (EU) 13031/10 of 31 August 2010 on Reflection from the Spanish delegation on a possible model for the Regulation on translations  LIMITE PI 94. Italy had also taken this position, but has since implemented the Regulations and ratified the Agreement. A complaint (2 BvR 739/17) made to the German Constitutional Court will apparently be decided upon in 2019, as evidenced by the Court’s list of cases at: https://www.bundesverfassungsgericht.de/EN/Verfahren/Jahresvorausschau/vs_2019/vorausschau_2019_node.html last accessed 25 February 2019. France, the UK, and 14 other Member States have ratified the Agreement. Although this is legally possible, the question remains as to whether it is politically possible. For a legal analysis, see Gordon and Pascoe (2016); Ohly and Streinz (2017), p. 245; Sellens (2018), p. 136; McMahon (2018), p. 175; and Walsh (2019). A number of views have been published on this issue. See for example: “EPLIT, BRAK, GRUR publish view on German complaint against ratification UPCA” (Kluwer Patent Blog, 25 January 2018) available at: http://patentblog.kluweriplaw.com/2018/01/25/eplit-brak-grur-publish-view-german-complaint-upca-ratification/ accessed 20 August 2018. The provisions of Council Directive 98/44/EC of the European Parliament and of the Council of 6 July 1998 on the legal protection of biotechnological inventions  OJ L 213/13 (Biotech Directive) were also implemented into the Implementing regulations of the EPC (Chapter V, Rule 26(1) Implementing Regulations to the EPC 2000) to ensure that patents on biotech inventions were treated the same across Europe. First mentioned in a dissenting opinion by Lord Reid in Van der Lely v. Bamfords  RPC 61. Catnic v. Hill & Smith Limited  RPC 183. In fact, a previous design that Hill & Smith had taken all the features of the Catnic invention. They had intended to manufacture this product until they received a writ for infringement from Catnic. Catnic v. Hill & Smith Limited  FSR 405. Catnic v. Hill & Smith Limited  FSR 619 (CA). Fisher (2008), pp. 133, 148. Wording of the 1973 Convention. Protocol on the Interpretation of Art. 69 EPC of 5 October 1973 as revised by the Act revising the EPC of 29 November 2000. Improver Corp v. Remington Consumer Product Ltd  FSR 181. Wheatly v. Drillsafe  RPC 133, 142. Kirin-Amgen Inc & Ors v. Hoechst Marion Roussel Ltd & Ors  UKHL 46. Patentgesetz in der Fassung der Bekanntmachung vom 16. Dezember 1980 (BGBI. 1981 I S. 1), das durch Artikel 2 des Gesetzes vom 4. April 2016 (BGBI. I S. 558) geändert worden ist (German Patents Act). Formstein (Moulded Curbstone)  RPC 597 (In the Federal Supreme Court of Germany). For example: Meier-Beck (2005); and Lord Hoffmann’s judgment in Kirin-Amgen. UK – Improver Corp v. Remington Consumer Product Ltd  F.S.R 181; Germany – Improver Corp. & Sicommerce AG v. Remington Products Inc, Case No. 2 U 27/89 (OLG 1991) translated in 24 IIC 838 (1993); Netherlands – translated in 24 IIC p. 832 (1993). Luginbuehl (2011), p. 10, has identified numerous cases wherein divergent decisions have arisen: Novartis AG and Cibavision AG v. Johnson & Johnson Medical Ltd and others 2009/2010 resulted in different decisions regarding the validity in France and the Netherlands on the one hand and the UK and Germany on the other; Document Security Systems v. European Central Bank 2008, where the Dutch courts came to the opposite conclusion of the German and French courts, as well as the Austrian patent office; Pozzoli v. BDMO SA 2007, where the patent was revoked in the UK and France, but valid and infringed in Germany; Angiotech Pharmaceuticals v. Conor Medsystems Inc 2007, which had different outcomes in the UK and the Netherlands; and Muller v. Hilti 1999/2000, where the German court was at odds with the decisions of the courts of Switzerland and France. More recently, this has happened in: Actavis UK Ltd & Ors v. Eli Lilly & Company  EWHC 1511 (Pat). For a detailed investigation into the interpretation of patents in Austria, Switzerland, Germany, France, Italy, the Netherlands, Sweden and the UK see Pagenberg and Cornish (2007). That is, until July 2017, as will be discussed below. Graham 2014, and Cremers 2016. Merrell Dow Pharmaceutical Inc v. Norton & Co Ltd  RPC 76, 82.
Genentech Inc.’s Patent  RPC 147, 197. Biogen Inc. v. Medeva  UKHL 18. However, this was later overturned for product patents in Generics (UK) Ltd v. Lundbeck A/S  UKHL 12. Human Genome Sciences Inc v. Eli Lilly  UKSC 51 [42–92], [103–111], [114–115], [117–118], [120–123], [126–129], . HGS v. Eli Lilly, . Case C-34/10 Oliver Brüstle v. Greenpeace e.V. ECLI:EU:C:2011:669. Case C-364/13 International Stem Cell Corporation v. Comptroller General of Patents, Designs and Trade Marks (ISCC) ECLI:EU:C:2014:2451. Harmon et al. (2013), p. 92. Grimme Maschinenfabrik v. Derek Scott (t/a Scotts Potato Machinery)  EWCA Civ 1110. Schütz v. Werit  UKSC 16. Warner Lambert Company LLC v. Generics (UK) Ltd t/a Mylan and another  UKSC 56. As will be seen below with regard to Actavis v. Eli Lilly  UKSC 48. Decision of the Bundesgerichtshof, 5 May 1998 (X ZR 57/96) – “Zahnkranzfräser (Gear rim mill)”. Decision of the Bundesgerichtshof, 15 April 2010 (Xa ZB 10/09) – “Walzenformgebungsmaschine (Roller-forming-machine)”. An English summary of the Walzenformgebungsmaschine case was provided by: Bardehle Pagenberg, IP Report III  http://www.eplawpatentblog.com/2010/October/Walzenformgebungsmaschine.pdf last accessed 11 July 2018. Including the decisions of the BoA. Paris District Court (Tribunal de Grande Instance de Paris), 3rd chamber 3rd section, 1 July 2016 (15/05880), Astrazeneca v. Mylan; Paris District Court (Tribunal de Grande Instance de Paris) 13 October 2015 (15/58725), Warner-Lambert v. Sandoz; Montpellier Court of Appeal (Cour D’Appell de Montpellier), Civil division section 2, 17 September 2015 (13/05047), MVF 3 APS v. Intelligent Insect Control; Paris District Court (Tribunal de Grande Instance de Paris), 23 September 2014 (14/58023), Lilly France v. Sanofi; Paris District Court, 3rd chamber 3rd section, 27 September 2012 (12/13507), Akzo Nobel v. Teva Sante. G5/83 Second Medical Indication of 5.12.1984, Reasons, 6. G1/13 Admissibility of referral of 25.11.2014, Reasons, 8. T154/04 Estimating sales activity/DUNS LICENSING ASSOCIATES of 15.11.2006, Reasons, 3. T452/91 of 5.07.1995, Reasons, 5.4.1. G 2/06 Use of embryos/WARF of 25.11.2008. Biotech Directive; Chapter V, Rule 26(1) Implementing Regulations to the EPC 2000. Schovsbo et al. (2015), p. 271; and Ohly (2013a), p. 264. As a result of Art. 267 Treaty on the Functioning of the European Union. For criticisms on the Brüstle ruling and discussion on the ISCC case, see Burke (2012), p. 346; Parker and England (2012), p. 738; Ohly (2013b), Moore and Wells (2015), p. 258; O’Sullivan (2014), p. 155; Minssen and Nordberg (2015), p. 493; and Nordberg and Minssen (2016), p. 138. Aerotel Ltd. v. Telco Holdings Ltd  EWCA Civ 1371, . G 3/08 Programs for computers of 12.5.2010. 17th European Patent Judges’ Symposium,  Supplementary Publication, OJ EPO 5. Beier (1983), pp. 707, 711. 15th European Patent Judges’ Symposium,  Special Edition, OJ EPO 1, p. 275. Article 11(5) EPC: The Administrative Council, after consulting the President of the European Patent Office, may also appoint as members of the Enlarged BoA legally qualified members of the national courts or quasi-judicial authorities of the Contracting States, who may continue their judicial activities at the national level. Lageza (2012), pp. 115, 125. Actavis v. Eli Lilly  UKSC 48. Besides the point on equivalents, whether equivalents should apply when it comes to the requirement of novelty has been questioned. This was discussed in Generics (UK) Ltd and others v. Yeda Research and Development Company and others  EWHC 2629 (Pat) and was decided that it should not. The doctrine of equivalents has since been discussed by the UK High Court (Patents Court) in: Illumina v. Premaitha  EWHC 2930 (Pat); Fisher & Paykel v. Resmed  EWHC 2748 (Pat); L’Oréal Société Anonyme v. RN Ventures  EWHC 173 (Pat); Bose Corporation v. Freebit  EWHC 889 (Pat); and Liqwd Inc and Olaplex LLC v. L’Oréal SA  EWHC 1394 (Pat); and by the UK Court of Appeal in: Icescape Limited v. Ice-World International BV & Ors  EWCA Civ 2219. Actavis v. Eli Lilly  UKSC 48,  and . Actavis v. Eli Lilly  EWHC 1511 (Pat), . Actavis v. Eli Lilly  EWCA Civ 555, . Actavis v. Eli Lilly  UKSC 48, . Interestingly, in Kirin-Amgen, Lord Hofmann (in the Supreme Court) may not have agreed with the opinion that Neuberger had (relating to the Questions) in Actavis when he made it in in the Court of First Instance in Kirin-Amgen. We now have the reverse where Lord Neuberger has changed the test of Lord Hofmann in favour of his own. This is most apparent in the treatment of the second question where in Kirin-Amgen, Neuberger said that it should be assumed that the person skilled in the art is told that the variant works, which now features in the Modified Improver Questions from Actavis v. Eli Lilly – Kirin-Amgen v. Transkaryotic Therapies  RPC 2, . For discussions on Actavis v. Eli Lilly, see Strath and Jacob (2018), p. 169; Jadeja et al. (2018), p. 564; Johnson (2017), p. 817; and Widera (2018), p. 238. Actavis v. Eli Lilly  UKSC 48, [44–52]. Actavis v. Eli Lilly  UKSC 48, [44–53]. Actavis v. Eli Lilly  UKSC 48, [53–54]. This point was also highlighted by Margot Frolingher during a keynote presentation at the UP&UPC Conference at the EPO in Munich on 3 July 2018. Judicial coherence and the UPC is also discussed in detail by Baldan and Van Zimmeren (2015), p. 1529.